Launching the blog this month has been exciting, albeit frightening at times. I never thought I'd start a blog, but this space is a natural extension of Inner Light's mission and an easy way to share more of my personal wellness journey. I hope that you've enjoyed reading along, I can't wait to see where this goes! 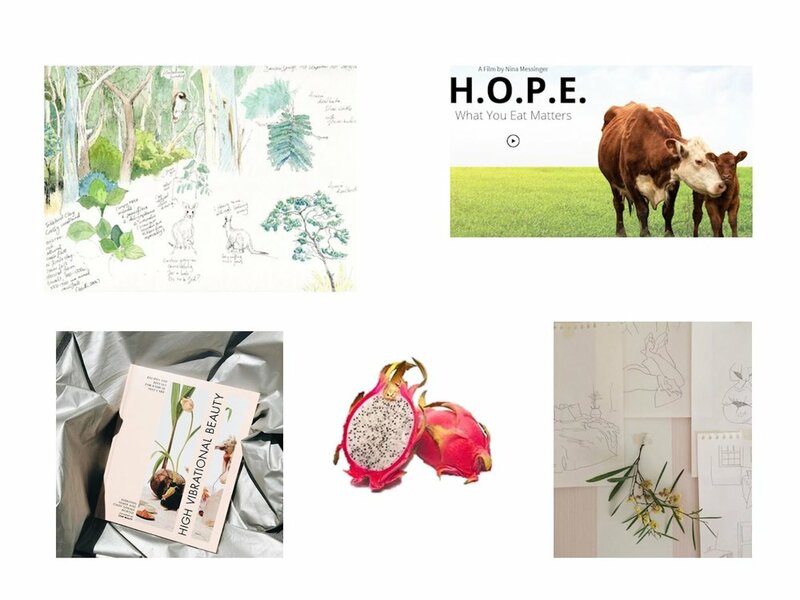 As the last post of each month, our Inner Light team will be sharing our monthly round-ups. What we're doing, reading, eating, using, watching... whatever is inspiring us and fueling us at this moment! You all know Haley, our amazing manager who has been working to build this business with me since we opened in July, and Jesse, who started with us in September and is here every weekend. Both these women are a daily inspiration to me and I love what they shared for their monthly finds. Nettle Leaf Tea Infusions: My hair started to fall out about a month ago from post-partum hormone changes - people should warn you that your beautiful pregnancy hair is only a momentary thing! Nettle leaf is rich in B vitamins that boost hair health, and I swear it's been helping. I drink it as an infusion - you steep in boiling water in a tightly closed jar for at least 4 hours and then drink at room temp or over ice. Tastes like sea water, in a good way! Nettles are also great for allergies, inflammation, lowering blood pressure, and much more! 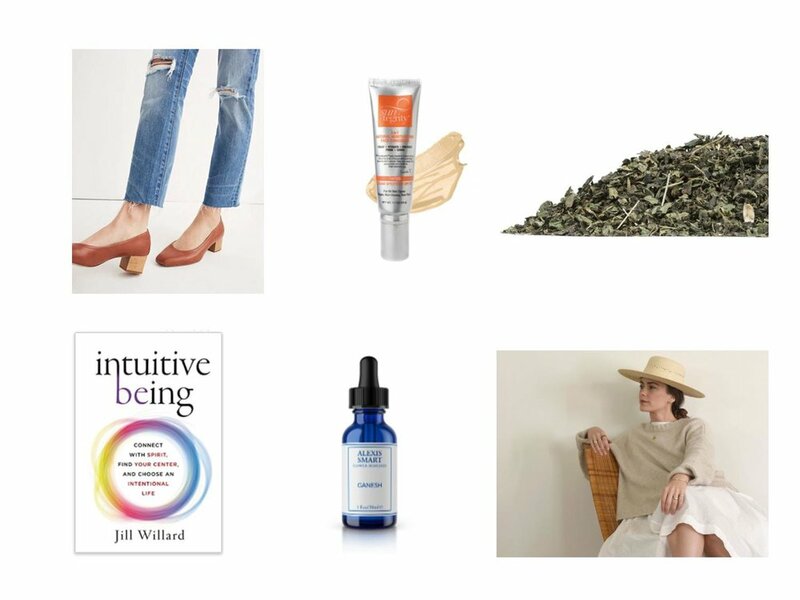 Intuitive Being by Jill Willard: I had read some of Jill's interviews on Goop over the years, and recently listened to her podcast with Elevate the Globe. I am loving her book about connecting to your intuition - which we all have. She is a gifted medium and intuitive, mama, and her writing makes a concept that can feel very "woo-woo" easy to understand and access. Buy here. Alexis Smart Flower Remedies, Ganesh: This is probably my favorite thing I'm using right now. I swear that it is working! Alexis' was trained for a decade by mentors in the Dr. Bach's flower remedy lineage and is also a homeopath. This tincture in particular is for confidence, and I swear it's helped me be bold enough to launch this blog, among many other things! Take 4 drops 4x a day for results. Find in our shop. Lacy Phillip's Interview on Manifestation on Goop: I have been a client of Lacy's for over two years now, and before that I was following her method on her blog Free & Native. She is an expert in manifestation, and her method works with reprogramming the subconscious to heal limiting beliefs in order to create the life you dream of. Since working with her I've launched two businesses (I was doing interior design before opening my dream business) and had my twin babies. If that's not proof of how well her method works, I'm not sure what is! Read more here. Outdoor Voices 7/8 Leggings: These are the absolute perfect legging to take you from yoga to spin or even to work (if you're as lucky as me). Shop here. Alexis Smart Whole Hearted Flower Remedy: This has helped my heart heal and feel more at peace. Healing is a constant practice, but I have felt a definite change in my heart since taking this magical remedy. Take 4 drops, 4 times a day under the tongue. *May be taken more frequently as needed. Shop in store. Amethyst: I have been working on my mind body connection lately and have kept this stone close to me at all times. Amethyst is the mother of balance, calm, and peace (it also helps eliminate impatience). Shop in store. WYLD Skincare's Konjac Sponge: I have become completely obsessed with Wyld Skincare's Konjac Sponge. It has completely changed the composition of my skin and leaves it with a smooth, dewy look. My skin prefers the Bamboo Charcoal, but this beauty also comes in French Pink Clay. Shop in store. Nature Journaling: I've set as a daily habit to put aside time to observe my environment and journal what I see. It can be for any length of time, only a moment or as long as the scene enraptures you. I found myself watching the politics of grackels for over half an hour the other day. I think a lot of us have an idea of "nature" as something we witness elsewhere, outside of where we live. On a trip to the tropics, on the west coast but it's surrounding us all the time. New England is an absolutely gorgeous place and I look forward to recording the creatures that live here! Hope: What you Eat Matters: I discovered this film on one of my favorite YouTube channels & blogs: Plant Based News. They describe it as a documentary uncovering and revealing the effects of our typical Western diet on our health, the environment, and animals. It is an absolute must watch for anyone interested in learning more about plant-based and vegan diets as well as those looking to renew their belief in the lifestyle. Plus Paul McCartney's a fan. Saying, "This important film highlights the choices we must make to help protect this planet and all its inhabitants." Watch more here. High Vibrational Beauty: Recipes & Rituals for Radical Self Care: I couldn't resist purchasing this book from Inner Light! It is a true beauty for so many reasons. The cover's a perfect peachy pink and is a great addition to any coffee table collection or bookcase. Throughout its 250+ pages are gorgeous photos of wellness rituals, plants, crystals, and recipes. A ton of recipes. It is gracefully divided by the seasons and I can't wait to delve into all the wisdom for summer habits and creations. Shop in store. Dragon Fruit: I can't rave about dragonfruit enough, they have become a staple on my grocery store runs. The CAP Beauty book has a quote from their friend a nutritionist Dana James, "Eat only beautiful foods." Dragonfruit fit into that. I've tried them with white and yellow flesh, I prefer the yellow, I've yet to find the gorgeous pink variety. I dream about it. So far my favorite way to eat them is sliced up small with agave drizzled over. It's a perfect afternoon sweet treat. Ines Longevial: A lucky Instagram find: Simple black and white sketches, particularly of the human figure are a true love of mine and Ines Longevial's art fulfills this and more. She describes her work as concentrating on two principal themes: femininity and nature. See more here.